I had always dreamed of standing in front of the Taj Mahal. As a very young girl, I would read my history books, staring at the photographs; vividly imagining, until the words came to life. I would breathe in the air, feel the marble on my feet, run my fingers through the delicate floral patterns on its walls, and soak in its beauty. Almost two decades later, my dream came true. I read as much as I can about the Taj’s history and art. I read tales of other travelers. I looked at hundreds of photos. Then, together with the most important man in my life, I embarked on a magical journey I will always remember. designated car, and settle in comfortably. We opted for the air-conditioned class, which had very comfortable seats. On the Taj Express Train, from New Delhi to Agra, I felt butterflies in my stomach. Hubby and I held hands during the entire trip. He frequently looked at me and smiled; I just couldn’t hide my excitement no matter how hard I tried. When I looked around to check the other passengers, I realized we were the only locals on board. Actually, since I am a Pakistani, that makes Hubby the only local on board. The entire trip took almost three hours. We had also booked our hotel, via phone, and had them arrange for a driver to pick us up from the station. We were in India for a month-long trip, plus it was my first time to meet Hubby’s relatives, so we had three huge suitcases in tow. We arrived at Agra station by 10 am. Hubby looked around, in search for someone who might just be looking for us. We didn’t have the local sim card, so Hubby called the hotel from a pay phone. The driver has left the hotel an hour ago to pick us up. We glanced at our heavy luggage. Fortunately, there is a Cloak Room in every train station in India ( at least that’s what hubby tells me). We checked in two of our suitcases there. All they require is for us to make sure that the suitcases have locks on them. They only charge 10 rupees per luggage, that’s less than $ 1, for 24 hours’ storage. And when we returned the next day to claim our stuff, our suitcases were there, safe and intact. While Hubby was busy depositing our stuff in the room, I waited outside. I noticed a group of Indian students; young boys and girls, laughing and having a good time. I also noticed some newly weds; the women wearing beautiful saris, jewelery, and garlands in their hair. One can easily recognize a newly wed Indian or Pakistani woman. They are well-adorned, and would lower their gaze shyly if looked at by strangers. Then came this very young girl, about six or seven years old. She was almost crawling, her delicate hands dragging her petite body and lifeless feet behind her. Her hair was unkempt, and so was her clothing. She approached a group of students, and with pleading eyes, raised her hand asking for some money. The girls in the group looked at the little girl, feeling sorry for her plight. They placed some coins in the palm of the girl. I overheard one the student expressing his anger towards the parents who have reduced their disabled daughter to being a beggar. Then came a boy, perhaps a few years older than her. He had in his hand a plastic bowl containing some coins, which jingled as he ran towards this little girl. Suddenly, he pulled the girl’s pony tail, laughed, and ran. The girl looked at him with anger, but did not say anything. The boy returned, pulled at her hair again, laughed, and danced. This time, the girl got up on her feet, and ran after him! I was shocked; the students looked at her in disbelief. The little girl could actually walk, no, run. Hubby returned with the receipt, and we headed towards the station’s main gate, where met the driver from the hotel. I’m not sure how he identified us, or was it the other way around? He took us to the car, and we settled in. Agra station has a rather rural look to it. 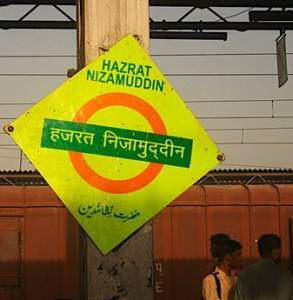 There was a huge board, quite visible upon leaving the station, that says “Welcome to Agra, City of the Taj Mahal“. There were some men back at the station who insisted to take us to our hotel. They asserted on charging us less than the driver from the hotel would. We knew this would happen, so for our own peace of mind, we booked a driver beforehand. 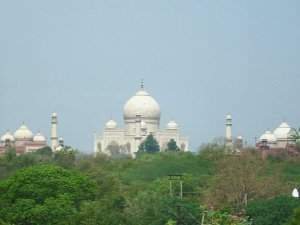 Agra is a modest city on the banks of the Yamuna River, with an average population of 1,800,000. 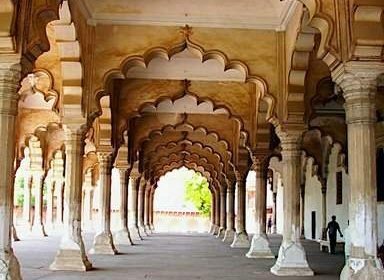 It achieved fame as the capital of the Mughal emperors from 1526 to 1658 and remains a major tourist destination because of its many splendid Mughal-era buildings, most notably the Taj Mahal, Agra Fort and Fatehpur Sikri, all three of which are UNESCO World Heritage Sites. I was in seventh heaven; Taj Mahal is just a kilometer away from where I stood. Hubby knew how terribly excited I was, so he let me gaze at the Taj through the window, while he put aside our belongings. A while later, the man from the reception called to ask if we would like to hire a car and driver to take us around the city. We agreed. We had an hour, so we freshened up, and headed to the restaurant downstairs for lunch. We didn’t like the food, but we did not have enough time to go out and search for another place to eat. The driver, same man who received us at the train station, was waiting for us at the lobby by the time we finished lunch. 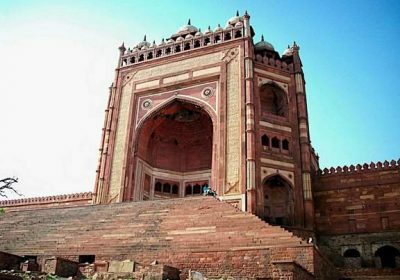 He took us to Agra Fort first, then Fatehpur Sikri. On our way back to the hotel, we had a brief stopover at a coffee shop for some snacks. It was almost dark when we returned to our room. We had a good walk that day, and our feet were aching. It felt so good to sit on a soft bed, in an air-conditioned room. 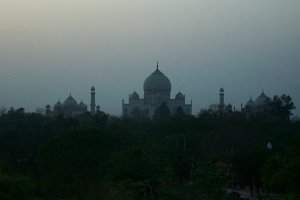 Every ten minutes or so, I would glance out the window to get a glimpse of the Taj. “Come on and get some rest, it’s not going anywhere,” Hubby said, probably wanting to have some attention for himself. We had planned to start early the next morning, right after Fajr prayers, to see the Taj. I reluctantly obeyed. Later that night, we discussed where to have dinner. We both didn’t want to eat downstairs. Hubby decided to order fast food. He called the reception and learned that we can order from Pizza Hut, so we did. And we enjoyed the pizza, garlic bread, and Pepsi. We wondered why we haven’t thought of ordering earlier for lunch. We had been in India for 4 days now. Four beautiful days: no office, no deadlines, no phone, no emails, no relatives, no cooking, and no laundry. 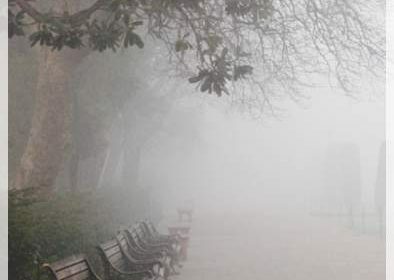 That night, just a few steps away from Taj Mahal, I slept in the arms of the man I love. Can i request for a story of how you met ur hub? When is this trip to India? Or is it happening right now? It was an arranged marriage 🙂 I’ll post on that topic one of these days. This was our honeymoon trip, April ’08. Pakistani married to an Indian! Did you have problems with visa & other paper work legalities? I know of a Pakistani married to an Indian & she is still waiting for her visit visa after more than a year of marriage! quite beautiful mashallah. 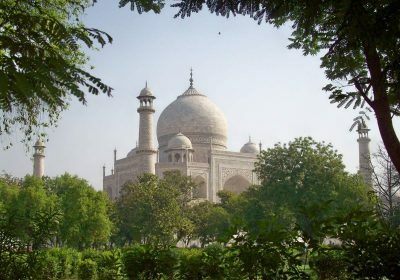 Cant say i’ve dreamed of visiting the taj, but it does have a beautiful story behind it.